Forward Madison FC has signed 20-year-old forward Zaire Bartley, who becomes the team's youngest player. Bartley, a native of The Bronx in New York City, has already developed an impressive resume despite a brief pro career, including playing for Jamaican youth national teams. According to Head Coach Daryl Shore, Bartley will play across the forward line for Madison. "Zaire can play as a winger or as a center forward," Shore said. "Even though he is only 20, Zaire's upside is very big. He came to us highly recommended from Damani Ralph (former MLS Rookie of the Year) and he's already had professional experience." Bartley will take cues from his longtime friend Don Smart, FMFC's first-ever player signing. Like Smart, Bartley grew up in New York with a Jamaican family. He's eligible for Jamaica's national team through his parents and has played for its youth teams. "Don gave me a call and he convinced me to come to Madison," Bartley said. "It's great knowing that I have somebody there in my corner." Bartley started his career with his hometown New York Red Bulls, making a handful of appearance for New York Red Bulls II in the USL Championship in 2017. 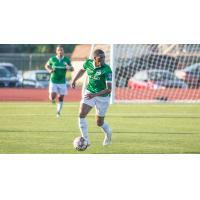 He then moved on to the New York Cosmos in the National Premier Soccer League (NPSL), where he scored four goals in four games during the team's 2018 NPSL playoff run. Most recently, he played for MFK Vys?kov in the Czech Republic. "Playing with Madison, I'm coming to show everybody what I've learned, how I play and who I am," Bartley said. "I just want to show the fans what I can do."